This isn’t a cut that’s been around for hundreds of years. It’s only with the recent use of computers and laser cutting that heart shaped cuts have become more common. The heart cut actually starts as a pear cut that is modified at the top with a cleft. 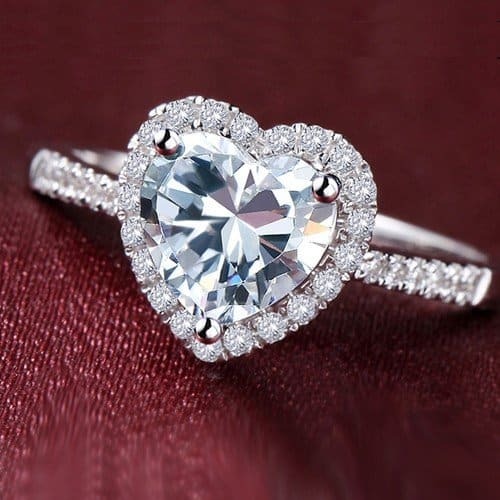 It’s a great ring for a woman who loves hearts and will appreciate how cute a heart cut diamond engagement ring can be. With the use of lasers and computers to make the cut, heart cuts are extremely modern. This can be incredibly attractive to those who love to have modern designs, and don’t want anything that’s antique or vintage looking. The low demand for heart cuts means that there won’t be many women who have the same diamond. At the office, she’ll likely be the only one wearing a heart cut diamond engagement ring. Something that is rare can be incredibly appealing. The heart is a unique design. Many of the other cuts are shaped like common objects; squares, circles, modified squares and rectangles. The heart is unlike any of these other shapes. The unique design can be further enhanced using surrounding stones in a variety of colors. There’s nothing more symbolic than a heart cut engagement ring. She’ll be blown away by the fact that you bought her a diamond in the shape of a heart. It’s incredibly romantic as an engagement ring. If you want her to cry when you propose, the heart cut diamond is a good bet to start the tears flowing. Some cuts look better when they have surrounding stones, but the heart cut looks incredible as a solitaire, which really shows off the unique cut. 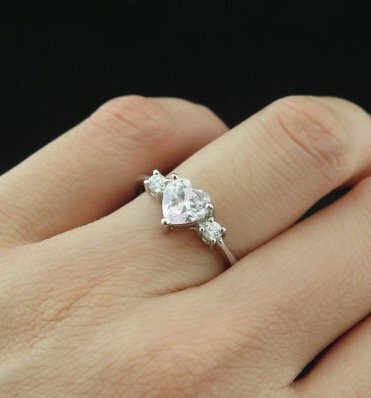 When you present her with a heart cut diamond engagement ring, it’ll really make an impact when it’s a large solitaire. With the challenging cut and uniqueness of the heart cut, it means that over time the diamond will increase in value. This is especially true if the diamond engagement ring is in a great setting and band. While some diamond cuts might not look as good with a rose gold band, like an emerald cut for example, rose gold feels like it was made for a heart cut diamond engagement ring. Pink and hearts are definitely romantic for the girl in your life who will love that kind of style. Heart cut diamonds have to be cut perfectly to get their high brilliance and fire. They have to be a perfect ratio of around 0.75 to ensure that they are the right proportion. Too wide or too long, and the heart will be misshapen. 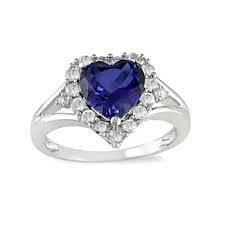 While this is a plus for many women, some don’t want to wear anything too trendy like a heart on their finger. Make sure this is the type of ring your girl would like before you buy it. She might like it now, but in a few years, it might feel outdated. This is a real concern for some of the modern, trendy jewelry in general. For heart cut diamonds, you’ll need to ensure that they have a color ranging from Flawless to VS2 and clarity from D to G. This is because the heart shape can often have a problem with a bow-tie effect. This shadow can be more noticeable in diamonds with lower quality. When choosing a heart cut engagement ring, ensure that it’s a style that she’ll love for more than a year or two. It can be a trendy, modern ring that might not fit every woman. Some women like more classic styles or vintage looks. While there are a few cons, there are more pros to this style of diamond cut for engagement rings. If you give it to her on Valentine’s Day, it couldn’t be more perfect!